Over 1180 pages plus CD-ROM. Instructions on how to fill out grant applications and get the money you need for your business, home, education, kids or just to help pay your bills. 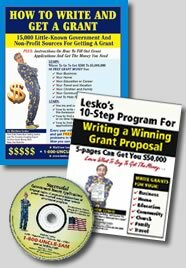 Includes Lesko’s 10-Step Program for Writing a Winning Grant Proposal!